Sparkling wine enthusiasts may turn their noses up at the mention of Prosecco, the world’s leading sparkling wine in terms of volume sold (160 million bottles sold), but like many things in Italy, to every rule there is an exception. 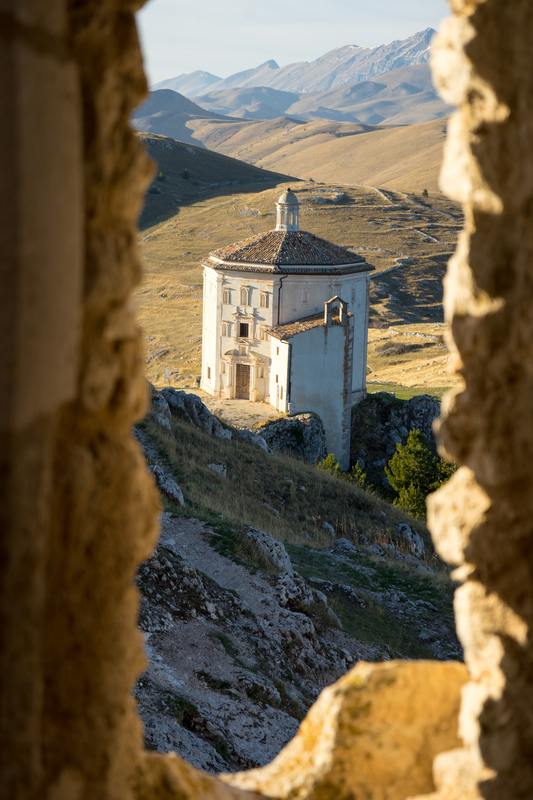 What is true is that the Prosecco region has grown at a disturbing pace now encompassing a vast territory spanning 9 provinces and 2 regions (Veneto and Friuli Venezia Giulia). Some argue that this growth was necessary in order to successfully internationally market the brand “Prosecco” but many despair that it has destroyed the name. The naysayers have a point. 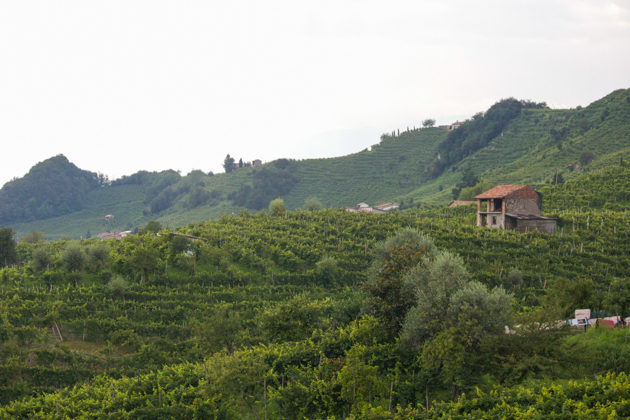 The vast majority of the Prosecco produced is more akin to soft drinks than the champagne it is emulating. Ironically, Prosecco’s origins however are in a town of the same name in Friuli where it was originally produced as a still wine (and to some extent still exists). The main difference between Prosecco and Champagne is its production method. Prosecco typically uses the Charmat method where the secondary fermentation takes place in large vats rather than in the bottle (champagne method). For a great article on the difference between the methods, see here. Prosecco also uses the green apple-flavoured Glera grape variety (previously known as Prosecco) whereas champagne typically uses more toast and almond-flavoured Chardonnay, Pinot noir and Pinot meunier grapes. Prosecco also tends to be slightly sweet (extra-dry, preferred by Italians, is 12-20 grams residual sugar and dry versions are 20-35 grams residual sugar) and so is served as an aperitivo. For more information on the differences between Prosecco and Champagne, see here. 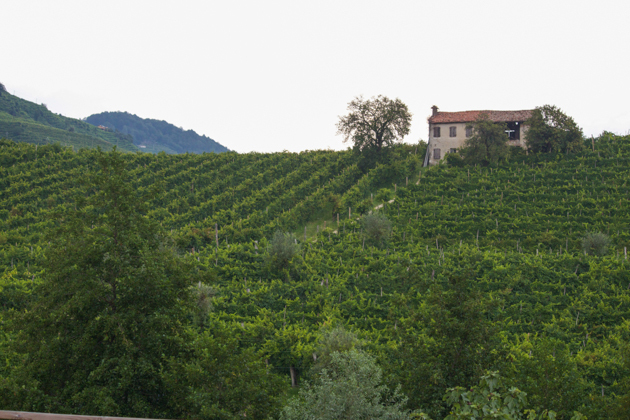 There is however a small area within the Prosecco region where more refined Proseccos are being produced and this is in the 18,000 hectare Conegliano Valdobbiadene DOCG subzone. Within this subzone is Cartizze, a 106-hectare cru area renowned for its superior Prosecco production due to its unique microclimate. Cartizze land sells for EUR 2.5 million per hectare and is divided up amongst 140 owners. The soil has firm rock below and crumbly stone, sand, clay and chalky soil on the surface. The climate has constant humidity and is 3 to 5 degrees cooler so that the grapes ripen very slowly. This slow ripening would particularly benefit the Glera grape variety as it grows quickly. 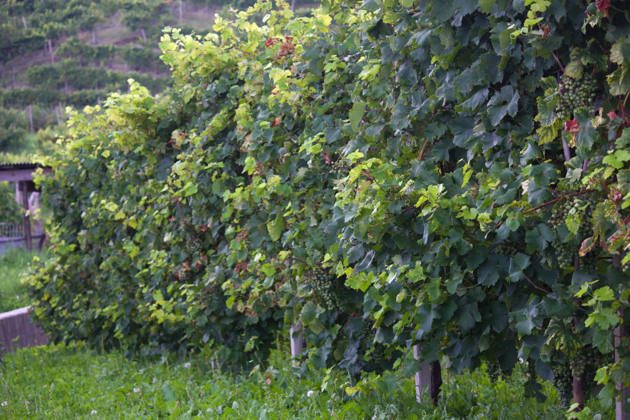 What we noticed first upon arriving in Valdobbiadene was how bushy the vines were, unlike in any of the areas we had been previously. Next to Cartizze is where we find Bisol, the only Prosecco producer (after 25 years of experimentation) using the champagne method for its top end Prosecco wines in this area. 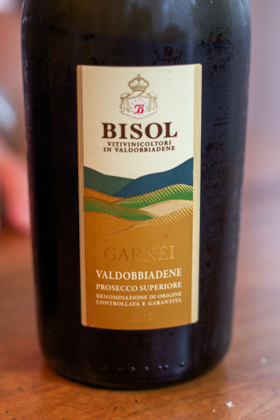 Bisol has been producing wine in Valdobbiadene for 500 years. 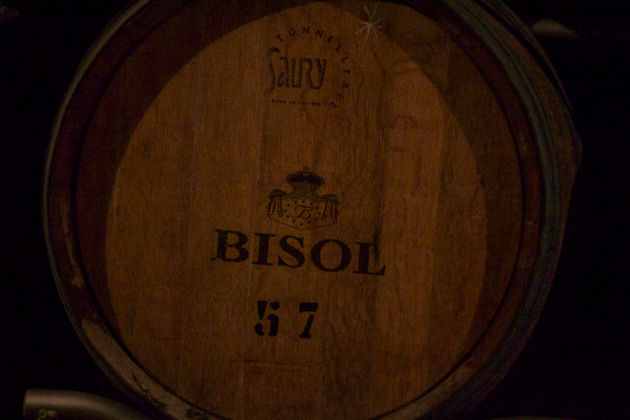 Eliseo Bisol first started commercially producing still wine before the First World War. Production stopped during the war as this area was on the front line of the war with the Austro-Hungarians. 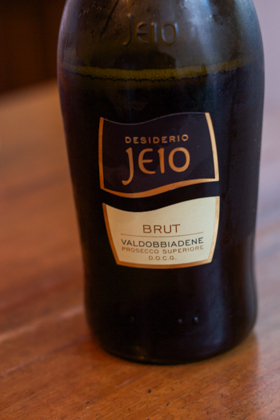 Eliseo’s son, Desiderio Bisol, restarted the business in the 1920’s and began producing sparkling wines as well as still wines. After the Second World War, Desiderio let his four sons take over the business with Aurelio in charge of the vineyards and Antonio as the president of the company. Production changed to primarily sparkling wines. 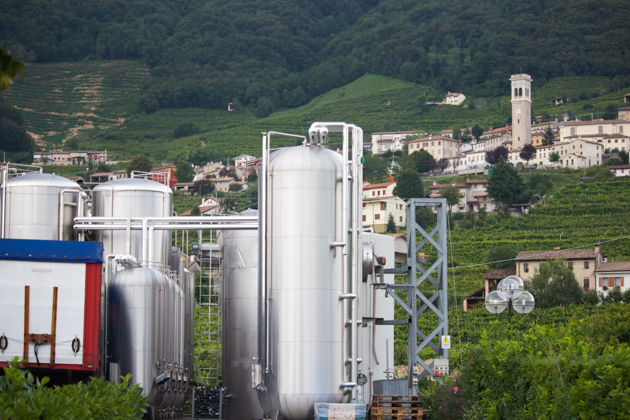 Today they produce 2.5 million bottles a year of what is referred to as the “Rolls Royce of Prosecco”. Bisol has 177 acres of vines spread over 20 vineyards in the traditional Classico area of Prosecco DOC which spans from Conegliano to Valdobbiadene and includes 3 hectares in the prestigious Cartizze sub-zone. 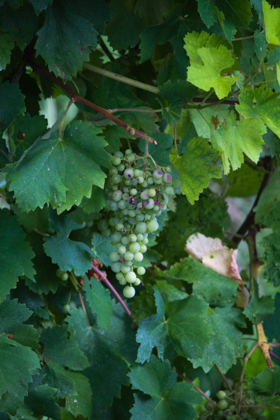 Bisol believes that Glera grapes grown in the Valdobbiadene area have a lot of fruit and acidity whereas those from the Conegliano area are sweeter. 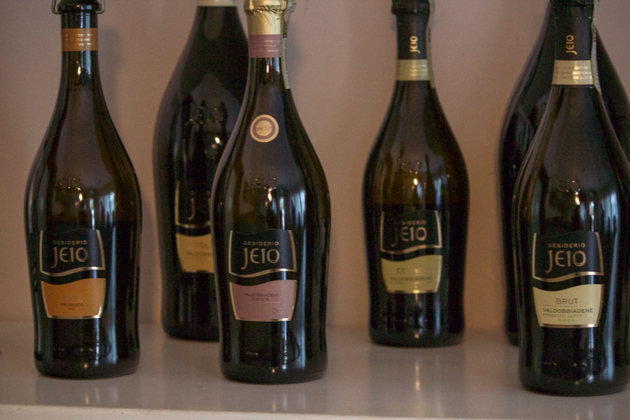 Bisol produces three lines of Prosecco: Belstar is their entry line, followed by Jeio and their Cru line is called Bisol. While the vast majority of the 2,500,000 bottles produced uses the Charmat method, the Bisol family are unique in that they have also been producing Champagne-method sparkling wines in Prosecco for over 50 years. They make both Glera-based and Pinot Nero, Pinot Bianco and Chardonnay based champagne-method sparkling wines. 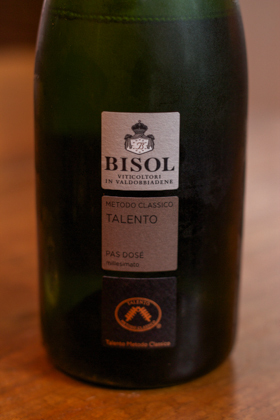 They were also members of the now defunct Talento, an institution created by 40 of the most important Italian sparkling wine houses to create sparkling wines with long secondary fermentations in the bottle and the use of dosage. The result of which is their wine “Talento“. At harvest, Bisol uses plastic baskets with a capacity of 18 kilos each which are stackable so that the grapes are not damaged. They are trying to reduce the amount of sulphur used in producing the wines while maintaining their freshness. Temperature control is paramount in order to create finer bubbles in the Prosecco. The wine must then be stabilized before bottling in order to remove the sediment and reduce any risk of explosion. 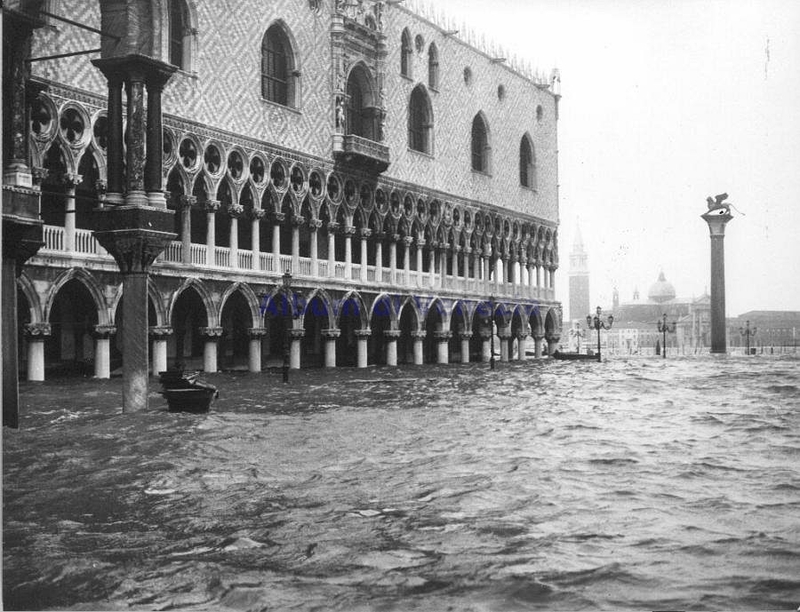 Bisol also owns the Venissa estate on the island of Mazzorbo near Burano in Venezia. The estate is a walled vineyard from which they produce a white wine wine from the Dorona grape and a red wine from Merlot and Carmenere vines. The estate also includes a hotel, restaurant, vegetable gardens, orchards and a fish farm. 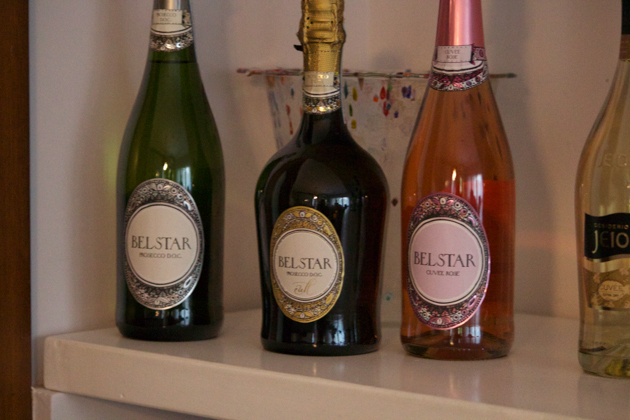 Belstar is made with 100% Glera grapes from 22 hectares of rented vines. 50,000 bottles are produced per year. 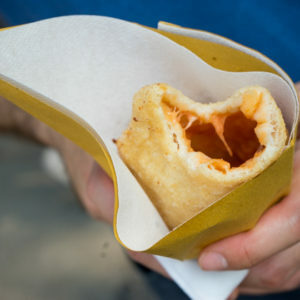 Jeio has been produced since 1990 and is dedicated to Desiderio Bisol as Jeio was his wife’s nickname for him. It is a blend of the Glera grapes grown in Valdobbiadene and Conegliano. Some of the grapes come from the same vineyards as used for their Cru Bisol wine and some are purchased from longstanding growers of theirs. Timing: Enjoy within 2 years. It is made using 100% Glera grapes in the Charmat method. Residual sugar: 16 grams. They produce 292,000 bottles per year. It is made using 90% Glera, 5% Verdiso and 5% Pinot Bianco and Chardonnay grapes in the Charmat method. Residual sugar: 11 grams. They produce 275,000 bottles per year. It is made using Glera, Chardonnay and Sauvignon grapes in the Charmat method. Residual sugar: 10 grams. It is made using 100% Glera grapes in the Charmat method. Residual sugar: 21.5 grams. This wine has been made without sulphites. It is made using 100% Glera grapes in the Charmat method. Residual sugar: 1.4 grams. They lightly press the grapes which are left on the yeast for several months during the first and second fermentations. They produce 5,000 bottles per year. The Bisol Cru vintage line started production in the 1950’s and 60’s. It is made using Bisol‘s own 33 hectares of land. Crede is the dialect name for the clay-laden soil in which the vines are grown. Made with 85% Glera and 10% Pinot Bianco and 5% Verdiso grapes using the Charmat method. Residual sugar: 7.5 grams. 120,o00 bottles are produced per year. The name comes from the name of the soft citrine rock scattered throughout the clay-laden marine sandstone soil where the grapes are grown. It is made using 100% Glera in the Charmat method. Residual sugar: 16.5 grams. Salis is the name for the rock fragments present in the sandy topsoil where the vineyards are grown. It is made using 100% Glera in the Charmat method. Residual sugar: 30 grams. 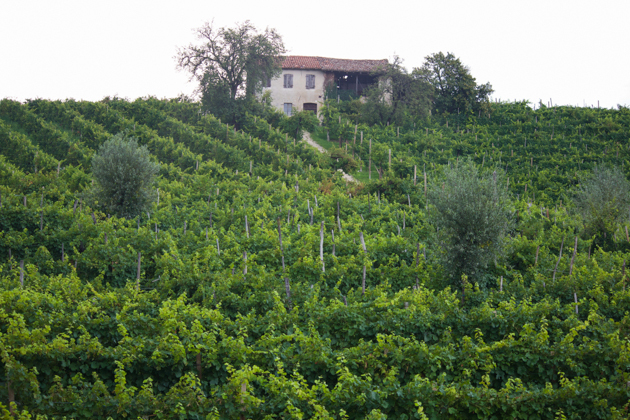 Fol is named for the vineyard’s location in Follo in the most historical area of Prosecco Superiore Di Valdobbiadene. It is made using 100% Glera in the Charmat method. Residual sugar: 16 grams. They produce 31,000 bottles per year. 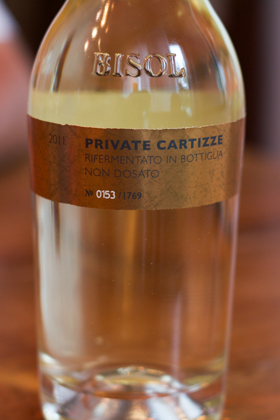 Cartizze is named for the location of the vineyard with in the prestigious Cartizze sub-zone of Valdobbiadene Prosecco DOCG. It is made using 100% Glera in the Charmat method. Residual sugar: 23 grams. 26,000 bottles are produced per year. The name Garnei in local dialect means “grape berries” referring to Bisol’s selection of the best bunches from the best vines throughout their vineyards in the Valdobbiadene. It is made using 100% Glera in the Charmat method. It spends 2 to 3 months on the lees and is aged up to 3 years. Residual sugar: 5 grams. They produce 8,000 bottles per year. We tried the 2012 vintage which was our favourite due to its relative complexity. This is a champagne method wine made from Glera grapes. Relio is the nickname for Aurelio Bisol. This wine is the result if experiments first by Eliseo, then by Desiderio and was finally achieved with the 2006 harvest under Aurelio. It was released in 2010 for the first time. It is made using 100% Glera in the Champagne method. Residual sugar: 3.5 grams. They produce 1,769 bottles per year. This is another champagne method Glera based sparkling wine. The grapes are from the top of the hill in the prestigious Cartizze sub-zone of Valdobbiadene. It is aged for 11 months on the lees. It is bottled simply but beautifully in a clear bottle with rope ties to keep the cork in place. 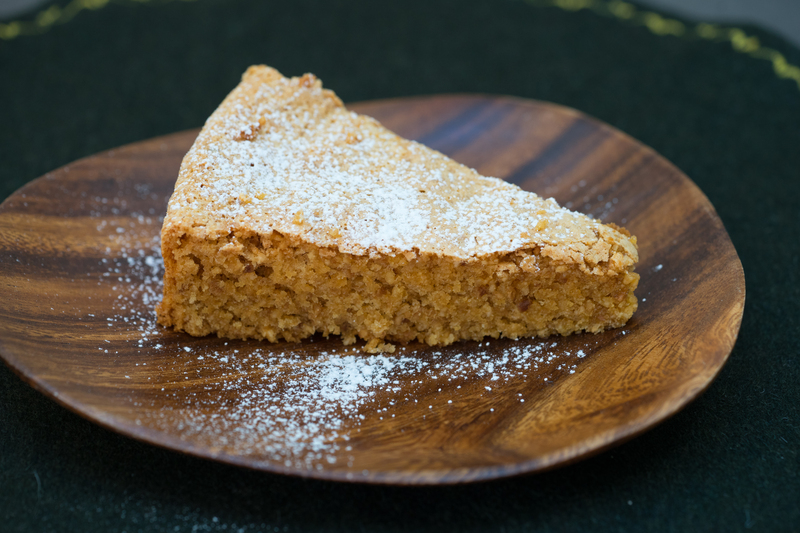 Residual sugar: 4 grams. 2,657 bottles were made in 2012. This wine is made from 20% Chardonnay, 40% Pinot Bianco and 40% Pinot Nero grapes which are aged for 5 years. It spends a total of 10 years being aged. Residual sugar: 8 grams. 8,100 bottles were produced in 2010. Relio is a champagne method sparkling wine made from 100% Glera grapes. The first vintage was 2006 which was released in 2010. Residual sugar: 3.5 grams. 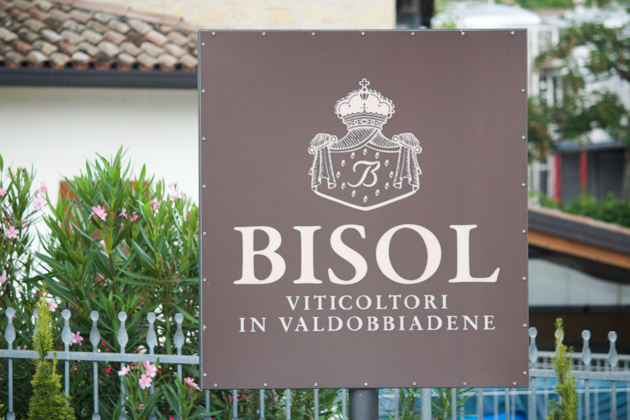 Bisol also produces red wines (Cabernet Sauvignon, Merlot and Marzemino based) and a passito-style sweet wine. Bisol’s estate on the island of Mazzorbo near Burano in Venice. 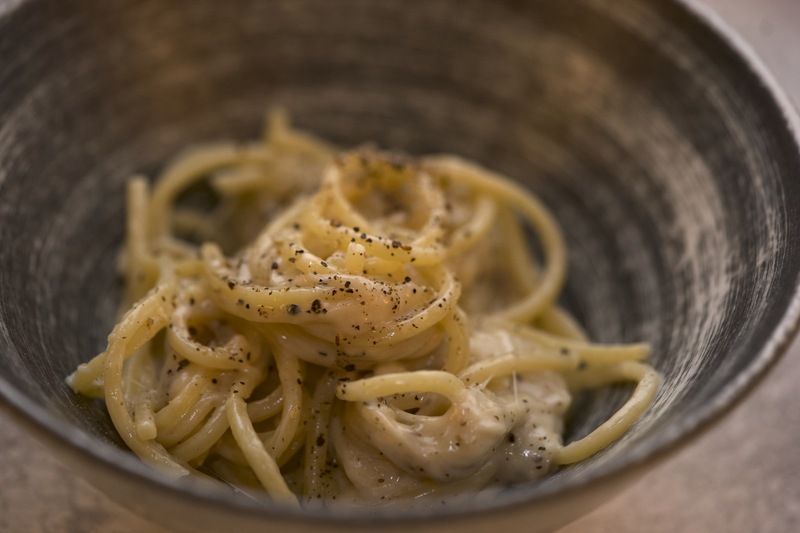 It offers accommodation and a Michelin-starred restaurant. Great article! I had zero understanding of prosecco (other than that I like it!) and now I feel much more enlightened. What is the wholesale or retail price difference between the Belstar and Bisol? Hi Julie, Thanks! 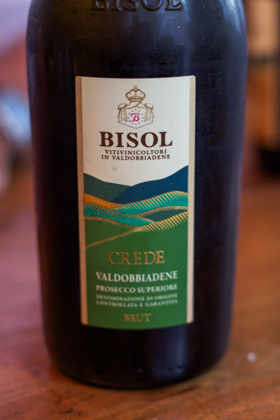 Depends where you live but in the UK, Belstar is about GBP 9-10 per bottle whereas Crede for example (in the Cru line) is GBP 12.50 to 13 or so. I think its worth the price difference depending on the occasion. Wine-searcher.com is a great place to find prices on wines near you.